In order to identify himself to all the villages, the young man would make a special flute. 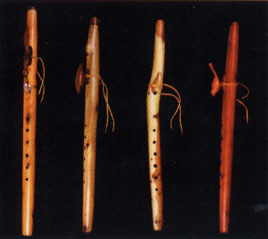 After dark, he would play this flute outside the lodge of a girl in whom he was interesed. If she were interested in him, she would slip outside to meet him. If she was not interested, she would pretend that she hadn't heard him. The young man was thence saved from a possible face-to-face rejection.